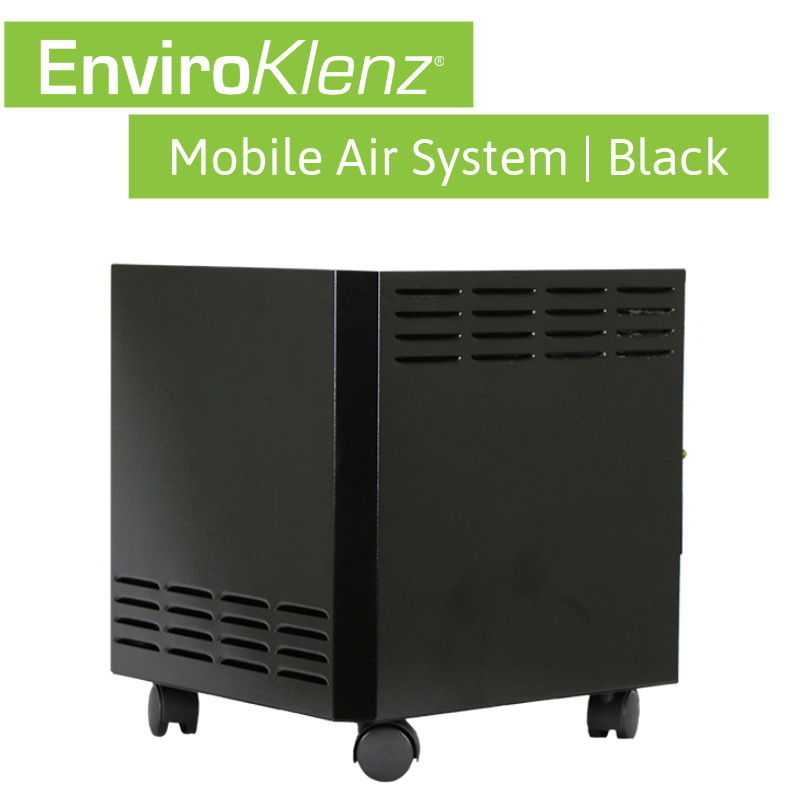 The EnviroKlenz Mobile Air System is your solution to removing airborne odors. 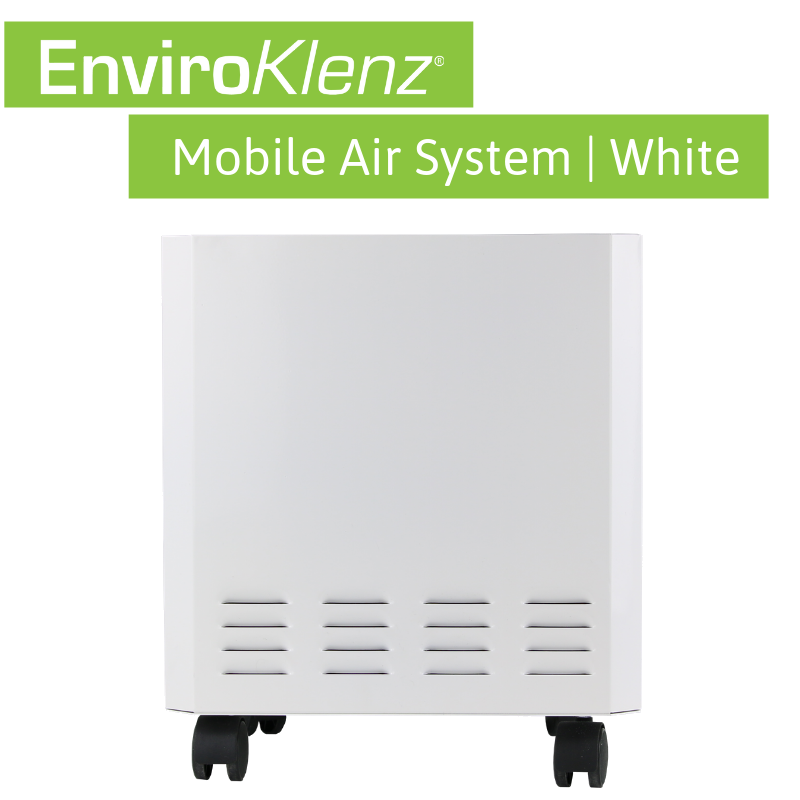 This EnviroKlenz mobile air system uses hospital-grade technology to guarantee the air in your home or office space stays as clean and pure as possible. The system covers up to 1,000 square feet with a quiet, efficient multi-speed blower that you can adjust to meet your needs. The unit is portable, and once the patented EnviroKlenz Air Cartridge (size 14”x14”x1” included with purchase) is installed, you will begin to remove and neutralize those unwanted malodors circulating in your home. And better yet, there are no tools required for maintenance, and the filter replacements are always available and easy to purchase from our website. 1. Remove the back panel of the Mobile System by unscrewing the two thumb screws located on each side – no tools needed to remove these screws! 2. Once the back panel has been removed, you will then place your HEPA filter in the system – making sure to place it on the bottom. 3. The EnviroKlenz Air Cartridge will be placed right above the HEPA filter with the air flow arrow pointing downward – the air flows from the top of the system down to the bottom, as the clean, purified air is re-released back into the environment. 4. To ensure the EnviroKlenz Air Cartridge stays in place, be sure to screw down the two interior bolts inside the Mobile System on each end of the air cartridge. 5. Place the back panel back on the EnviroKlenz Mobile System – screwing in the two thumb screws on the back panel. 6. Plug in the Mobile System into an electrical outlet, and select your desired speed on the front of the system – 4 speeds (High, Med, Low, Whisp-Air). Place the EnviroKlenz Air System in the center of the room with both stage filter installed. Plug the unit in and turn the unit on high. The system will quickly exchange the air several times over the course of a few hours. When running the system on High, you will receive the full 250 CFM of air exchange. 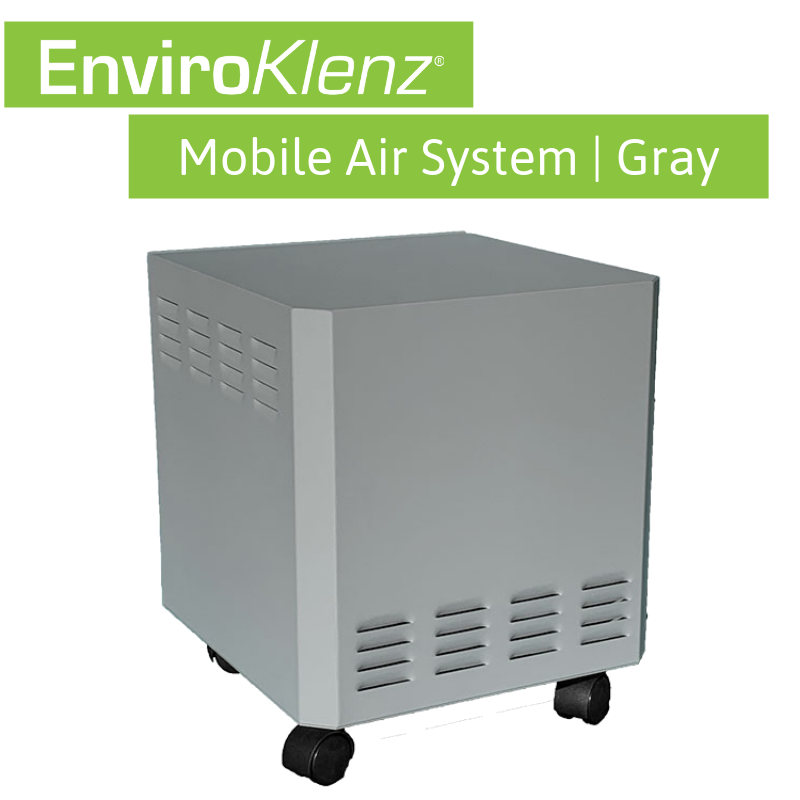 The EnviroKlenz Mobile System can be used in bedrooms, living rooms, kitchens, basements, and even gyms. 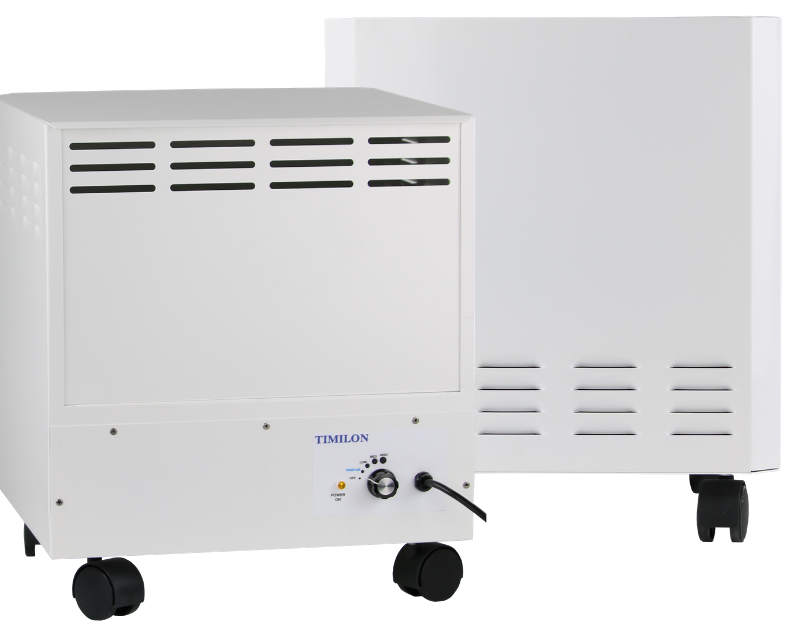 The EnviroKlenz Mobile Air Systems come with two filters, the EnviroKlenz-Air Cartridge (14 x 14) and a hospital-grade HEPA Filter. 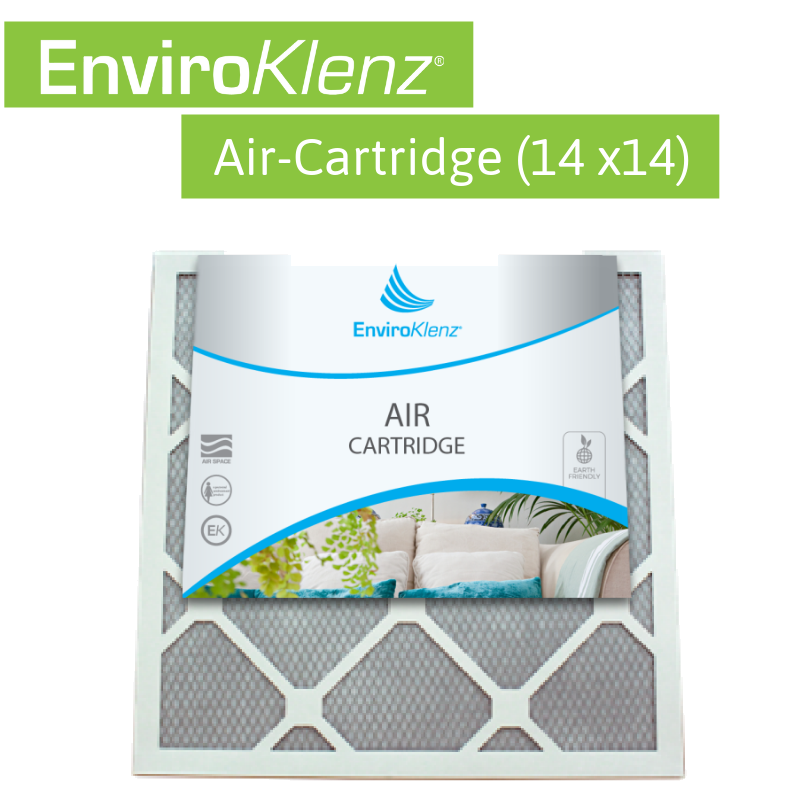 The EnviroKlenz-Air Cartridge (14 x 14) uses our patented earth mineral technology which works through a process of destructive adsorption of the chemical odors and VOC’s. As polluted air comes into contact with the EnviroKlenz earth minerals it adsorbs, neutralizes, and breaks down the chemistry of the chemical compound while actively capturing dust, dander, and allergen particles. The EnviroKlenz-Air Cartridge (14 x 14) is recommended to be replaced every 6 months! 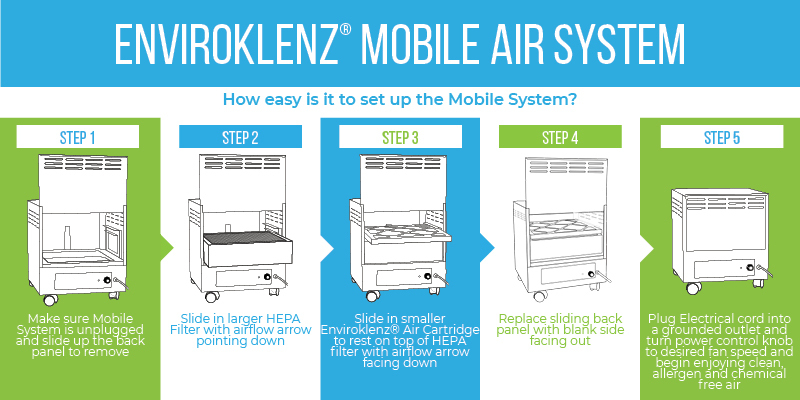 The EnviroKlenz Mobile Air System Replacement HEPA Filter utilizes ultra-fine, fiber medium that captures microscopic particles to remove at least 99.97% (9,997 out of 10,000) of particles 0.3-micron in diameter from the air passing through the filter. 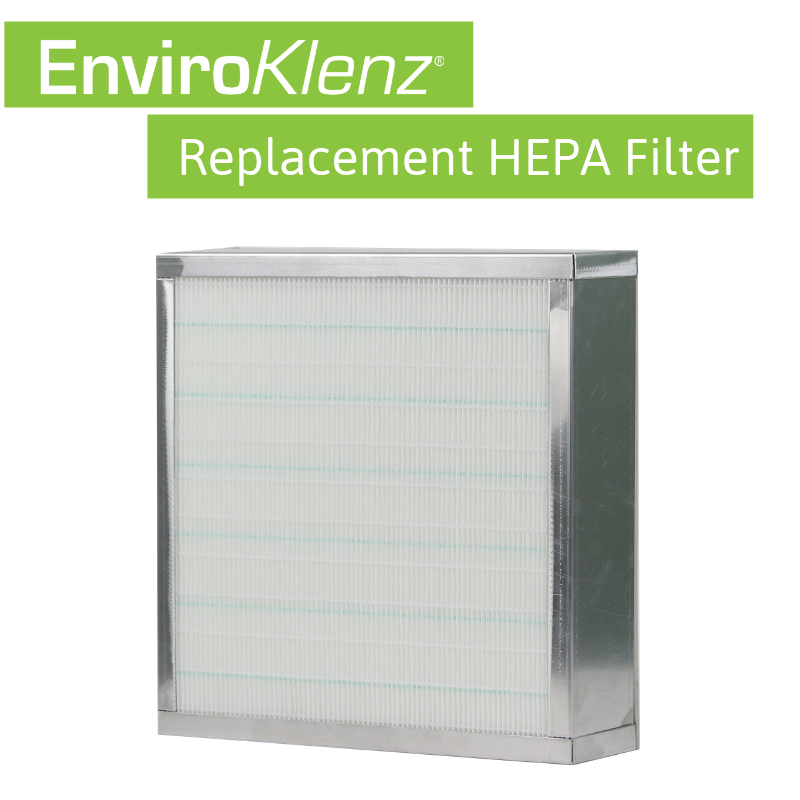 The EnviroKlenz Mobile Air System Replacement HEPA Filter is recommended to be replaced every 2-3 years!